The main aim of the new role is to provide information and advice to new hill walkers and to the many members for whom hill walking is their main activity. This new position, funded by Sport England, will solidify the BMC's support for hill walkers and comes in response to feedback from our members. In the latest BMC membership survey, 62% said hill walking was their primary mountain-related activity. Carey Davies, previously assistant editor at one of Britain's most popular and long-running hill walking magazines, The Great Outdoors (TGO), has navigated his way into the BMC office to take on the role. Carey said: “It’s an exciting prospect to start a new job – particularly one which has never been done before! I’m the first BMC officer to be dedicated to developing and promoting the work the organisation does for hill walkers. “A lot of people have the impression that the BMC is an organisation for climbers alone but so much of the work it does benefits hill walkers too. The BMC was instrumental in securing the right to roam provisions of the Countryside and Rights of Way Act, granting walkers the freedom of upland areas in England and Wales. You have probably trodden on footpaths maintained to a high and sympathetic standard with the help of the BMC’s conservation work. 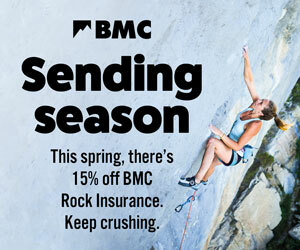 The BMC is literally fundamental to the ground you’re walking on! And don’t forget those indispensable British Mountain Maps developed by the BMC in conjunction with Harvey Maps, or the insurance services it offers that specifically cater for hill walkers and trekkers. “Nevertheless, there is huge scope for expanding the work the BMC does for hill walkers – watch this space as there will be new projects, promotions, campaigns and events to draw more hill walkers into the fold and help develop our hill walking-focused work. A big part of my role will be to publicise this work and get the message across to hill walkers who don’t already realise - the BMC is for you too! Carey will be busy writing for the website and Summit, organising walking meets and events, cultivating partnerships with other outdoor organisations and helping publicise what the BMC does for walkers through articles, video and social media. He'll also oversee continuation of the BMC's partnership with Harvey maps on our successful series of British Mountain Maps. 1. Funding projects which benefit hill walkers through the BMC’s Access & Conservation Trust (ACT). For example, ACT helped fund recent footpath restoration projects in the hugely popular Yorkshire Three Peaks area, the Peak District and the Black Mountains. 2. Providing a voice in Parliament on any hill walking matter through the All Party Parliamentary Group for Mountaineering. For example, a recent House of Commons adjournment debate saw MPs discuss and acknowledge the economic value of hill walking to the rural economy. 3. Instrumental in securing the right to roam provisions of the Countryside and Rights of Way Act (CROW) and will continue to promote interests of hill walkers in the decadal review of CROW maps. 4. Keeping pressure on DEFRA and Natural England to continue to roll out new access provisions around England’s coast, as set out in the Marine and Coastal Access Act (MCAA). These will create a coastal access corridor, giving everyone the right to roam on our long and beautiful coastline. 6. Working with the Sport & Recreation Alliance and the Forestry Commission on better access to private woodlands in England. 7. Working with the Snowdonia Society on the annual litter clear up of Snowdon. 8. Supported the creation of the all-Wales coastal footpath and will continue to campaign for improved access to the Welsh coast. The BMC believes that as a minimum there should be open access to a coastal corridor not just a linear coastal footpath. 10. Supporting the Outdoor Industries Association (OIA) on the Britain on Foot campaign to encourage British people to get active in the outdoors. 11. Producing regular hill skills content for the BMC website and Summit magazine; free publications such as green guides and the New Hill Walkers booklet; and the series of British Mountain Maps in conjunction with Harvey maps. Love the idea of walking in the mountains this summer but want to have the right know-how first? Join us in the heart of Snowdonia to learn the skills you need to be a confident hill walker, at a bargain price.